Goldsmith's Cottage01263 715779work01603 870304fax Self-cateringLocated on the fringes of north Norfolk, this delightful 19th century cottage was once the millers house as it was near to the mill, which can still be seen in the village to this day, next to the River Bure. A cosy spot with a pub round the corner and a village store, Goldsmith's Cottage also welcomes four-legged friends and with some great walking country on the doorstep, the daily constitutional will be a delight! Not far from the glorious coastal villages, marshes and nature reserves to the north, The Broads National Park to the east and Norwich to the south, a stay here is a great location for exploring the very best that Norfolk has to offer. Goldsmith's Cottage offers weekly bookings starting on Friday. 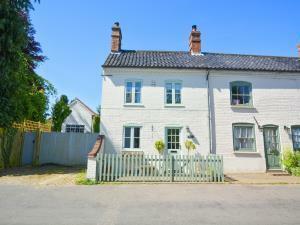 Located on the fringes of north Norfolk, this delightful 19th century cottage was once the millers house as it was near to the mill, which can still be seen in the village to this day, next to the River Bure. A cosy spot with a pub round the corner and a village store, Goldsmith's Cottage also welcomes four-legged friends and with some great walking country on the doorstep, the daily constitutional will be a delight! Not far from the glorious coastal villages, marshes and nature reserves to the north, The Broads National Park to the east and Norwich to the south, a stay here is a great location for exploring the very best that Norfolk has to offer.